Exclusive! 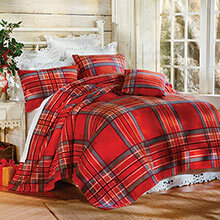 These Emerald Plaid Fleece Blanket and Accessories are a great option for crisp nights. Whisper-weight brushed polyester fleece. Super-soft and easy-care. Machine wash. Imported. I was not sure about the warmth of this but WoW it is a Great Spread . My Hubby has a Fleece sheet under it as his circulation is Bad but I only have a Cotton sheet & we are both snug as BUGS without all the weight of some comforters. You'll LOVE this set.